I have a delicious, simple and healthy dessert idea for you. The other night I wanted something easy to make for dessert, but I did not want it to be packed with calories. I also had strawberries I needed to use up. 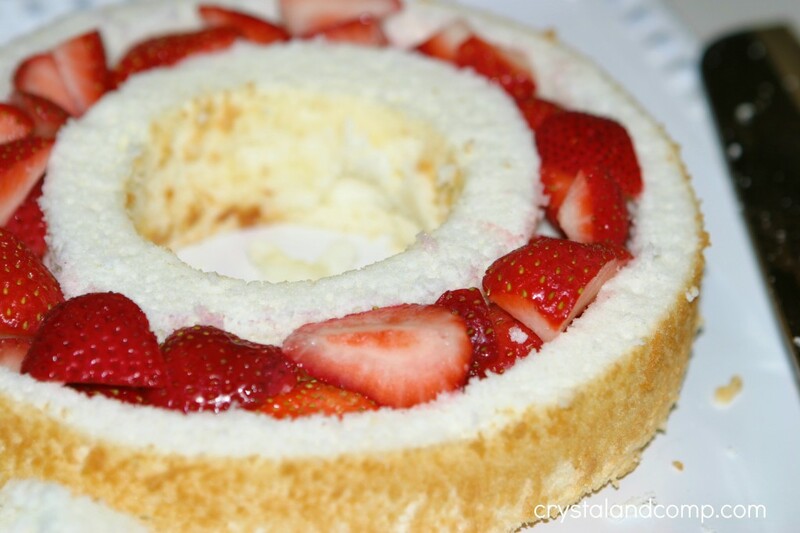 So this is what I came up with… Strawberry Angel Food Cake. 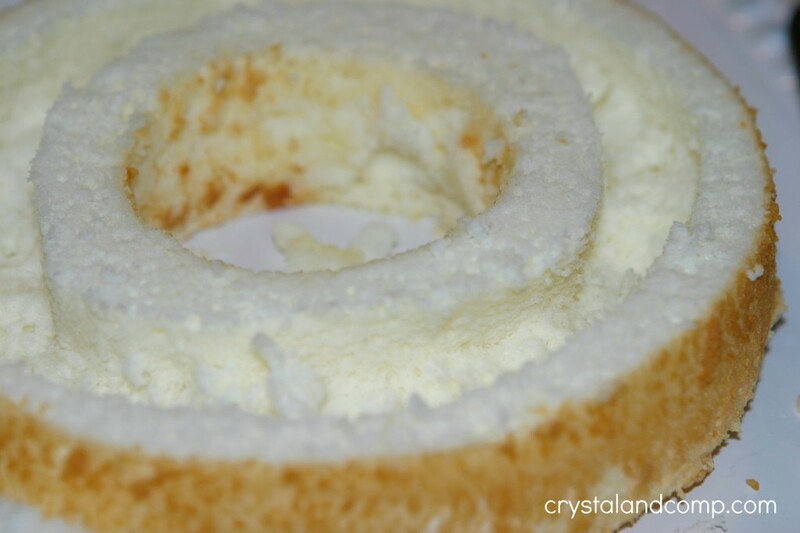 Take your angel food cake and cut the top off about 1/4 th of the way down. Save that top layer because we are going to add it back on. Then, use a knife to cut out an inner ring like the picture below. Take your fresh strawberry slices and fill that center cut out full of the fruit. You totally could use sugary strawberry puree, that would be so delicious, but I was trying to cut down the sugar. 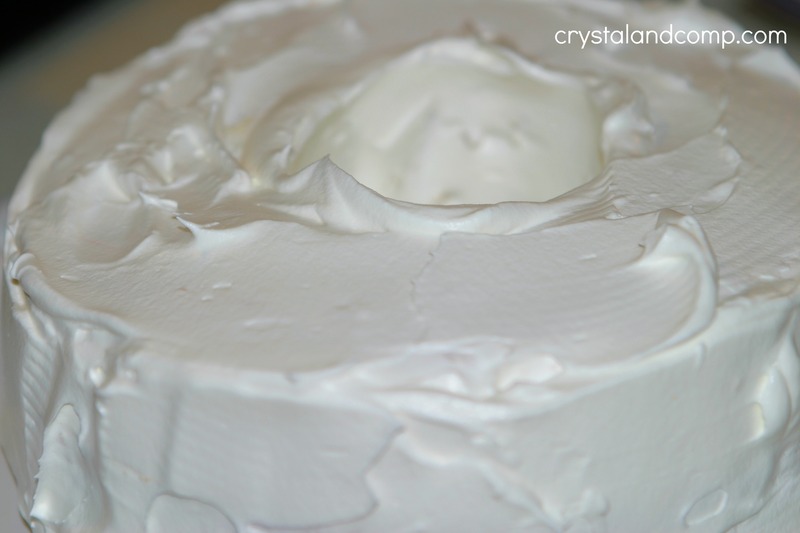 Place the top layer back on the cake. Use whipped cream and spread it all over the cake. 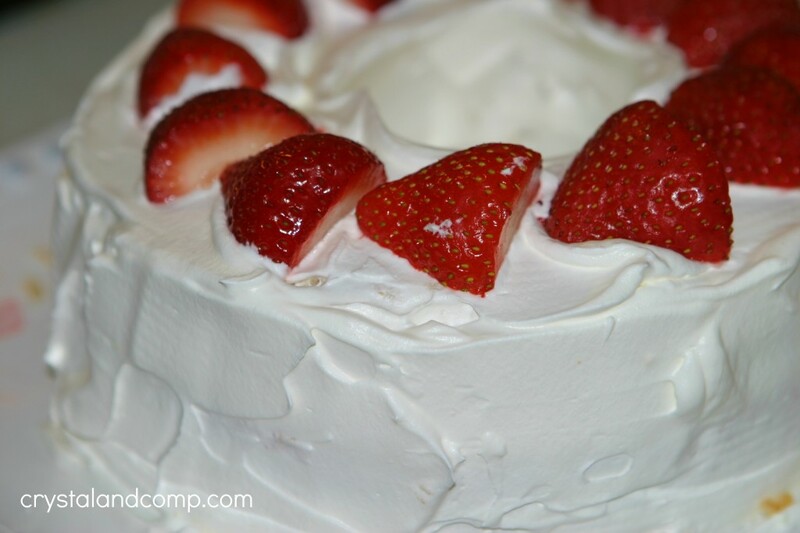 Add some fresh strawberry halves to the top of the cake. Slice it up. 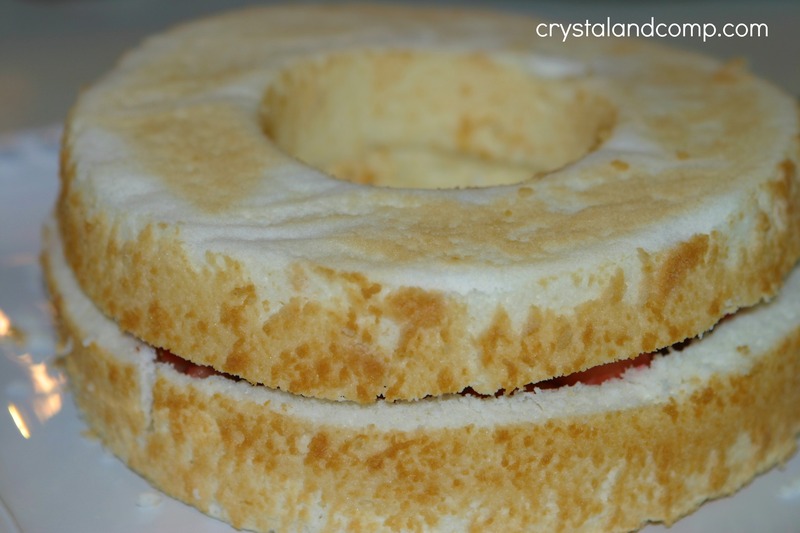 Your children and husband will love it and they will be so surprised by the hidden strawberries inside! We devoured every last slice! This looks so pretty and scrumptious! Thank you so much Margo! It was yummy! Hi Crystal! I watch you and Kelli every opportunity I get. I love your hangouts and love both of your pages. You have taught me so much. I wanted to let you know that I recently started a monthly link party called Everyday Entrees for Around $5.00. I know that times can be tough for all of us, yet we still want to put a fantastic meal on the table for our family. I would be so tickled if you would search through your main dish meals and share a few frugal meals at the party. Thanks so much! Hope to see you there! By the way, my family would love this dessert! Cynthia- thank you so much for your kind words about our weekly #LearntoBlog hangout. Kelli and I really enjoy doing them and we are go grateful for loyal viewers like you! I am so happy you are learning. What an awesome idea for a linky party. Families are always searching for affordable meal ideas- excellent resource you are providing. I will go through my meals and go link up. I will also add your party to my spreadsheet. Yum, yum, yum! I’m sooo making this! What a great idea! 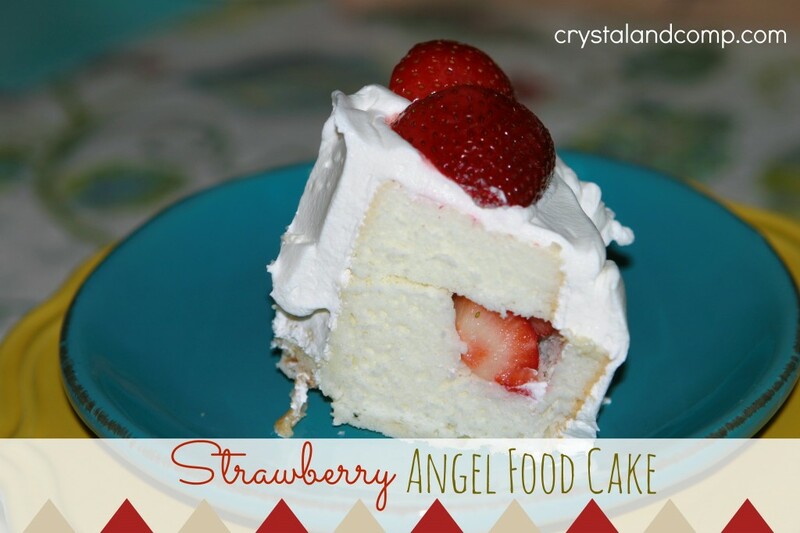 I love strawberries, and think that they go perfectly with Angel Food Cake (you can’t have angel food without the strawberries) but have never thought to put them inside the cake. Love this! Best part is I bet your kids & husband didn’t realize you where trying to use up the strawberries before they went bad or cut down on the sugar. Ricki- they loved it! I did too. Def trying this! Thx for sharing. 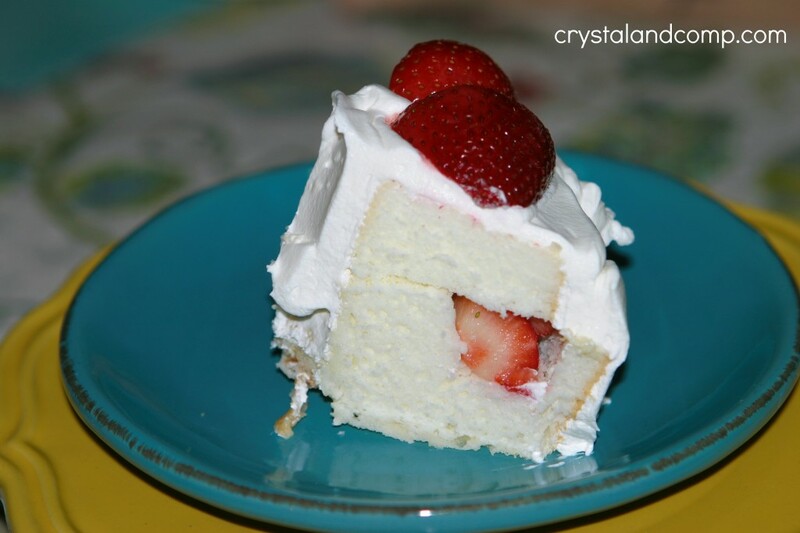 I have similar version , I cut a ring (well) around center of cake pull it in pieces the cake, mix with strawberries and cool whip put mixture back in well, frost with cool whip can save some strawberry juice to tint cool whip frost entire cake, HINT adding crushed pineapple to mixture is awesome as well as adding some to cool whip if you frost cake.